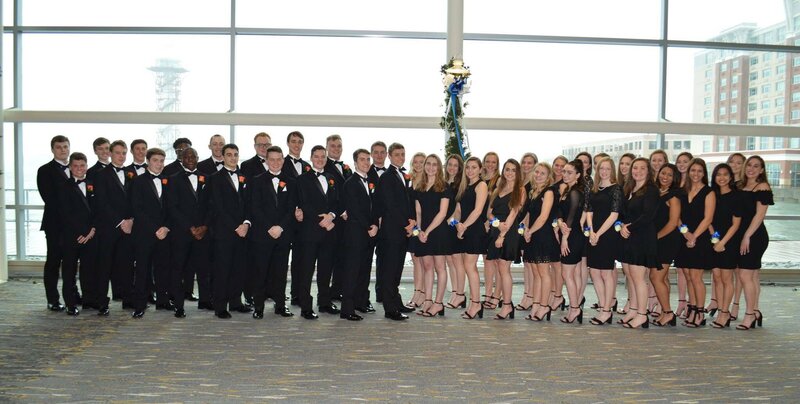 On March 30, Cathedral Prep, Villa Maria Academy, and Mother Teresa Academy held their annual Legacy Gala event to raise money and to induct outstanding Cathedral Prep and Villa Maria alumni into the President’s Hall of Fame. The event was held at the Erie Bayfront Convention Center and had over 500 guests in attendance. Some of the activities that were included in the event were a silent auction, a live auction, donations for Tuition Angels, and live performances from the Prep and Mother Teresa Academy bands. Items that were up for grabs at the silent auction, which began the evening’s events, included famous paintings by Red Skelton, various bottles of wine, kitchen appliances, spa passes, quality rugs, and more. After the silent auction closed, it was time for the induction of four outstanding Prep and Villa alumni into the President’s Hall of Fame. The inductees this year were Mike Alexa ‘70, Matt Clark ‘82, Kate Emling ‘71, and Julie Ferrick Wilson ‘84, who all gave speeches upon receiving their awards, talking about how Prep and Villa prepared them to be successful in life. After inductions, it was time for one of the biggest events of the Gala, the live auction. This year’s auction featured many great items, such as front row seats for Prep and Villa graduations, tickets to the Masters golf tournament, a cooking trip to Paris, Cathedral Prep State Championship football items, and more. After the exciting bidding at the live auction finished, it was time for the donations to Tuition Angels. Tuition Angels is a program that was started by Prep, Villa, and MTA that works to help bring down the cost of tuition for the school’s students. They raised money for this program by allowing the guests at the Gala to raise their hand and indicate if they wanted to make a $500 donation to the program. Many who attended the event were very generous in donating to this great cause, donating well over the $500 minimum and making it a huge success. Along with wonderful donations made at the Gala, another donor agreed to match each dollar raised at the Gala, which brought the total amount raised to $116,000! Overall it was a very successful and enjoyable night for all involved in this year’s Legacy Gala. In total, $408,000 was raised for the schools and many laughs were shared as well. The night concluded with guests singing the Prep and Villa alma maters, which truly shows the immense love and support these schools have in their alumni communities.